This is a subject that I have been pondering for quite awhile and is probably just an initial effort at expressing some opinions. To me the subject is at once complicated, disturbing and perhaps a view of our ( United States ) future. I am a great fan of political novels, especially those set in our era. Those that depict events similar to those that are occurring and make reference to actual people and places in the course of their books. I have referred before to Daniel Silva whom I thoroughly enjoy and I have just finished a book by Michael Walsh, Hostile Intent, that addresses some similar issues but from a quite different perspective. Factored in to my post is a challenging nonfiction book that I have just begun to read. It is by British author Melanie Phillips and it its premise dovetails nicely with my fictional reading. These slightly disparate works all have one word common to them that struck me quite forcefully. That word is Londonistan, which is the title of Ms Phillips book. Walsh mentions and I am fairly certain that Silva does also. Both fictional writers speak heavily of the concept as well. What is the concept of which they speak? Ms Phillips says it best in the intro to her book. She begins her intro with the London subway suicide bombings of July 7. 2005 and its implications . She asserts that it reveals London as the epicenter ( good Joel Rosenberg word) of Islamic militancy. She uses the word ” Londonistan” which is a mocking play of the names of London and state sponsors of terrorism such as Afghanistan. You can think of others. She added this chilling detail that one could argue that al-Qaeda actually began in London in the 1980s and 90s. She continues to talk about Britain in essence turning on itself and attacking its own historical values. And this next may be the most troubling. There is underway an attempt to establish a separate Muslim identity in the country. This is in a country approximately 5% Muslim . So there is a minority attempting and succeeding in many ways to impose its values on the host country. A tiny but illustrative example is that piggy banks are banned from British banks lest Muslims be offended. Funny, maybe, but not ha-ha funny by any means. British Muslims actually insist they are under Western attack and blame any wrongdoing by Muslims on others. One more thought before part #1 closes. British liberals fear being labeled racist or Islamophobic so Muslim extremism goes somewhat unchecked and criticism is against the so-called bigot. The London train bombings were, by this logic, caused by American , Israeli or British policies. My intent is to refer to Ms Phillips book again in part #2 as well as some fictional references from Walsh and perhaps Silva. As I alluded, her book is a difficult read for me but I hope to plow through a bit further. The little country of Yemen is very newsworthy these days; more so than in a while. The map shows the country’s position and an interesting one it is. 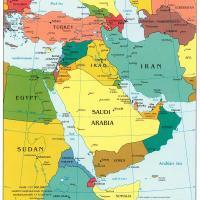 One can see it shares a border with Saudi Arabia and how it juxtaposes with Iran, Iraq Egypt,etc. And of course there is that little thing about the Christmas Day bomb attempt by a young Nigerian who was allegedly trained and funded by al-Qaeda from Yemen, whew! But the Yemeni news continues. Seems that the terror guys have posed threats credible enough to get both the United States and Britain to close their embassies in Yemen. This on one hand, while on the other we offer financial aid and training for Yemeni police and military. Full power of the United States at work and will spare no effort. So said the President, in words to that effect, and no more diplomatic presence. If we’re scoring ladies and gentlemen, we will give this round to Osama and friends ( Yemen is an ancestral homeland for the bin ladens) are we not? I heard a retired general on Fox this morning, can’t remember his name, who called Yemen a “petri dish” for terrorism. Now, biology was never a strong subject for me but I believe that has something to do with an environment where things are grown. If that is the case, this impoverished country with a near non-existent economy will loom increasingly large on our radar.